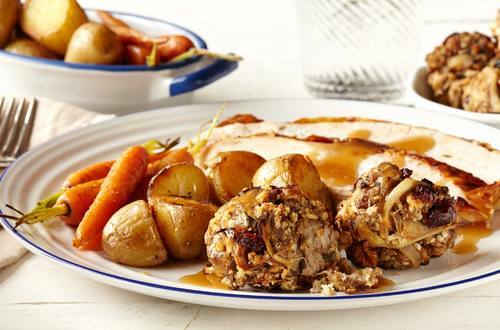 This juicy turkey stuffing recipe is delicious. Add a touch of magic to any roast dinner with this creamy Hellmann's® or Best Foods® Real Mayonnaise-inspired stuffing. 1 Heat olive oil in medium skillet and cook onion and garlic over medium heat, stirring occasionally, until onion is tender, about 4 minutes. Turn into large bowl. 2 Add remaining ingredients into bowl and thoroughly combine. Use to stuff turkey and cook according to turkey directions. OR, turn into greased 2-qt. baking dish and bake at 350° for 30 minutes or until golden. *Substitution:  Use 1 tsp. dried sage leaves, crushed.